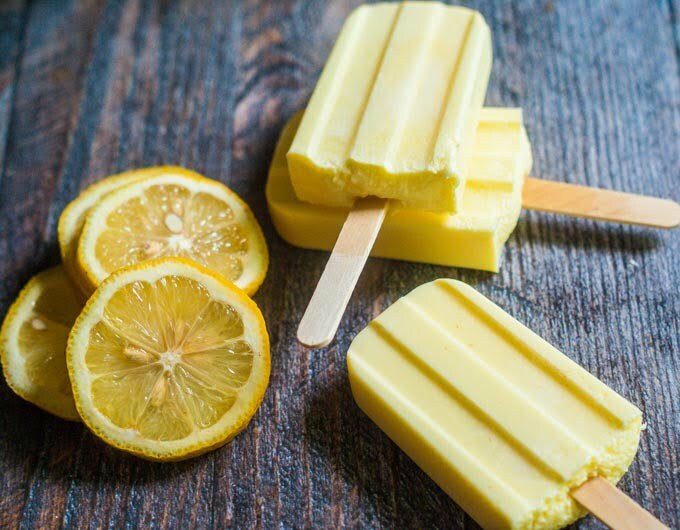 Low Carb Jello Pops - Just 2 Ingredients! It’s summertime and I want to eat ice cream everyday. Seriously. We used to have a soft serve ice cream place only two miles from our house on the bike trail. This meant we could ride our bikes there and back and call it exercise! I was in heaven that summer. However they closed it and I was sad. 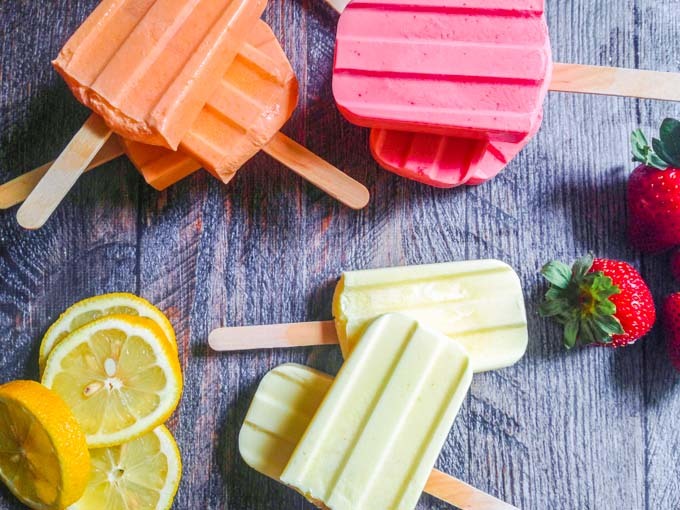 Anyway, I need to have a cold sweet treat in the summer and I came up with these low carb Jello pops to kill my ice cream cravings. It works! These are creamy and sweet and only have 1.1g carbs per pop. My husband even asked me if they where store bought! And did I mention they only use 2 ingredients? Because I use sugar free flavored gelatin, there is a lot of flavors to pick from. Today I made lemon. orange and strawberry. I have sweet tooth. A big sweet tooth. That’s why I’m always looking for low carb sweet treats. 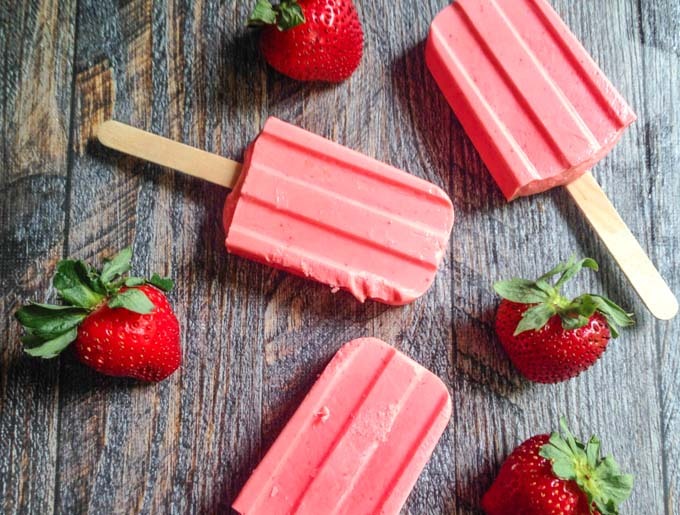 For that reason, I have many low carb frozen treats in my repertoire, such as: Chocolate Strawberry Treats, Peanut Butter Cream Cheese Bites, Maple Walnut Freezer Fudge, Berry Cream Cheese Bites. But I wanted to make a delicious popsicle. Ok the real reason is because I also bought two cool popsicle molds from Amazon. The first is a silicone mini pop maker which I have some crazy plans for and a quality popsicle mold which I used for these pops. I’m really happy with both molds but I’m trying to come up with some killer popsicle recipes so I can use them more. Unfortunately this isn’t as easy as I thought and so far this recipe has been my best. It uses sugar free Jello mix with cream. When you make it, you put it in the blender which whips the cream along with the gelatin. The result is a creamsicle type pop. It was a big hit with my family. 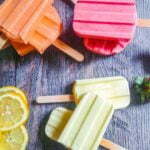 As I mentioned above I made three flavors: lemon, orange and strawberry. Above are the lemon that my husband loved so much. My son preferred the orange. I think they reminded him of an orange creamsicle or an Orange Julius. 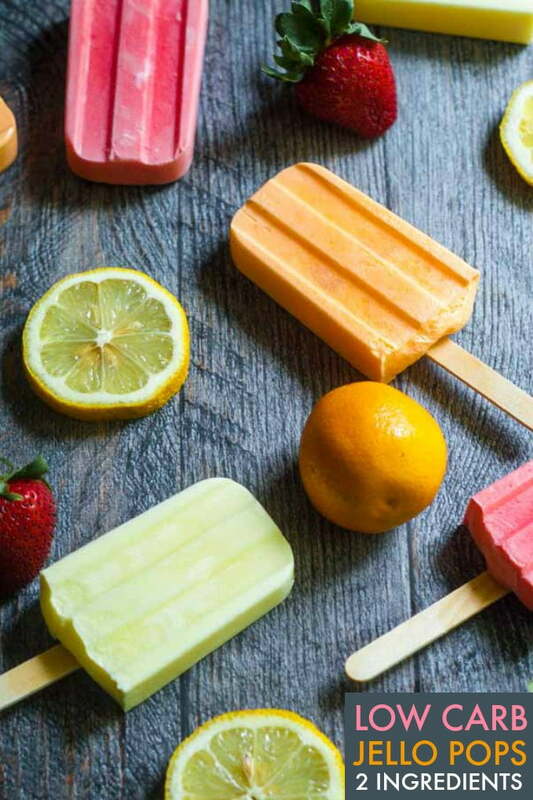 The strawberry pops were my favorite because I love berry flavors. Now for the simple recipe. I chose to use heavy whipping cream because it would make it creamy but also because it has less carbs than milk. You can try other milk products or almond milk but I don’t think it will be as creamy. That’s up to you. Start with a 4oz. packet of sugar free Jello (that’s the small box) and to it, add 1/2 cup of boiling water. Mix until the Jello is dissolved and then add it to the blender along with 1 cup of cream. Blend on high until nice and creamy. Pour into your molds and freeze until they are hard. It takes at least 4 hours in the freezer. For more easy low carb recipes, follow me on Instagram! In a bowl, add your gelatin and boiling water. Add this mixture to a blender and add your cream. Blend on high until it gets nice and creamy. 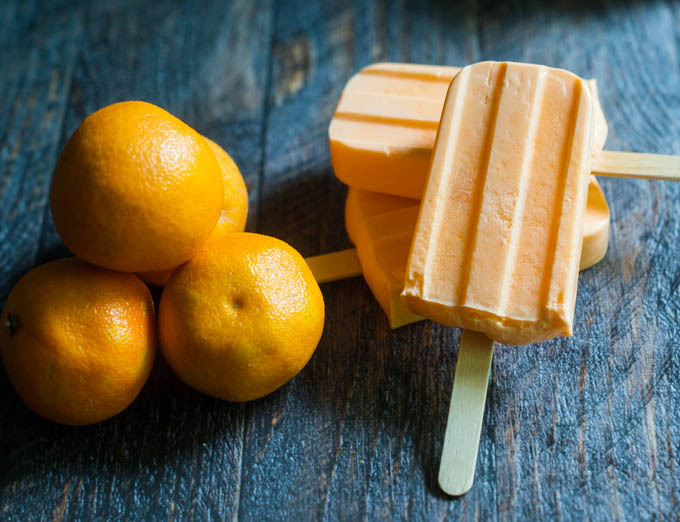 Pour into your popsicle molds and freeze for at least 4 hours. Can i use half and half instead of whipping cream? Hi Cynthia, I don’t see why not. Good luck! So sorry they didn’t work out for you. Here is the nutritional information for a cup of heavy whipping cream. And remember you are dividing this by 6 servings. I don’t use this particular calculator though. I just grabbed the first one I could easily copy and paste. Can I add fresh fruits? Hi Michelle, if you are watching carbs you might want to just be careful what fruits you use and how much. However I don’t think a single pop would need that much fruit so yes you can. Hope that helps! Hi Denise. What if I just wanted to make the popsicles more like ice pops without the cream? Would it still have popsicle consistency? I tried to make ice pops with Crystal Light and they came out solid like a flavored ice cube that I couldn’t bite. I’m wondering if the gelatin would fix this problem? Hi Amy, I am not sure but it might. I am in the process of making some boozy pops and I’ve added a bit of gelatin to them to make them more creamy (it’s for a milky one). So I think you are on the right tract. Please let me know if you try this and it works! Can I just make this like ice cream and not popsicles? I have no idea what the outcome would be. Sorry about that. If you do make it, let me know how it goes! Hello! This recipe sounds amazing. Im all for the fruit flavor jello but what would I do to make a chocolate or vanilla flavored pop? Can I use unsweetened cocoa powder or unsweetened choco mixed with gelatin? I have not done this yet but here are a few ideas. You could always use a box of chocolate sugar free pudding with the cream however that will have more carbs. Realistically however it won’t be too many carbs. Or you can use unsweetened cocoa powder, sweetener, gelatin and cream. However this would require paying around to get the amounts right. I am going to be making something similar to this soon so I’ll let you know. Hope that helps! That would be great! I will definitely stay tuned. 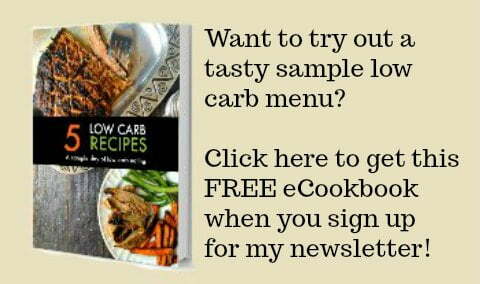 Love your site and the recipes. Thank you so much for the quick reply!!! Hi Antoniette, I have a post coming up that I was playing around with and here is the basics of what I did. I put a little cream in a bowl and sprinkled some gelatin over it. About a teaspoon. You want to let that sit for about 5 minutes. Then I add cocoa powder and Torani’s sugar free syrup (or sweetener). Heat up some almond milk to boil and add that to the rest of the mixture and whisk until the gelatin dissolves. Then pour and freeze. Hope that made sense. So it’s cream, gelatin, cocoa powder and sweetener. Then add boiling almond milk, whisk and freeze. Let me know if that works for you. hi, Correct me if I am wrong but these ingredients are not keto complaint such as Maltodextrin, Aspartame and Red 40. I would love to find a sugar free jello without all these bad ingredients. Do you by chance know of any? I would agree with you that these are not keto. I mainly follow a low carb diet and do not label my recipes keto unless the macros match up to a keto profile. As for the chemicals, yes they are not good for you but you could probably make a more natural pop. What I would recommend is using Great Lakes gelatin (red can) or any unflavored gelatin. Then to make a berry taste, use some berries, sweetener and perhaps to a bit of lemon juice. The sour brings out the sweet taste. Then add in the cream or coconut milk. You would have to play around with the amounts to get it right. Hope that helps! Hi- I love the thought of this recipe, but I’m doing a candida cleanse and can’t have whipping cream (or dairy). Do you think coconut milk would work the same?? I don’t see why not. Maybe even try coconut cream. Please let me know if you try it! I made these with coconut milk and they turned out great! Thanks for chiming in about the coconut milk Alison and helping out my readers! I’ll have to try that next time. Did you use coconut milk in a carton? Or the stuff in a can? Hi Valerie, I’m guessing that she used the canned coconut milk. But I’m just guessing. Heavy cream is whipping cream, if you mix it on high in a powerful blender you end up with clumpy whipped cream and the liquid jello does not blend in, for those people that had the chunky problem, just stir it in a cup or just blend it for like 3 seconds. Thank you for the recipe! my first batch was chunky but the rest turned out so good! Thank you for the tips Sarah! I’m sure my readers will appreciate it as much as I do! Hi, I am allergic to artificial sweeteners. will this recipe work with regular jello instead of sugar free? I want to try this recipe so bad but I want to use Great Lakes gelatin and add the flavour with food-grade essential oils instead of using flavoured gelatin (I don’t trust the sweeteners in those jellos). How many tbs of Great Lakes gelatine should I use? Hi Misty, I am not sure. I too use Great Lakes gelatin so I think 1 Tablespoon of gelatin (red can) gels 2 cups of liquid and a small box of flavored gelatin usually calls for 2 cups of water so I’m guessing 1 tablespoon. Does that make sense? Good luck! Ice pops make me so ready for some warmer weather! These are so colorful. Me too! Bring on the sunshine and warmth! Hi Denise. I’d like to try using original flavor liquid coffee mate for this recipe in place of the cream. Do you think it would work? If so, would I still use 1 cup or do you think it would be a different measurement? I don’t think you will have a problem. I don’t know what the carb count would be though. I would probably use the same amount as the whipping cream. Hope that helps! How and when do you add the fruit flavors? The fruit flavors come from the gelatin. I will update the recipe to let others know that. So the two ingredients are a package of sugar free gelatin in the flavor of your choice and heavy cream. You add the gelatin mix to bowl along with boiling water. Whisk until the gelatin has dissolved completely. Then you add that to a blender along with the heavy cream. Blend for about 20 seconds or well combined and then pour into the popsicle molds. Please let me know if you have any other questions. I made mine with peach jello. I had some fresh blueberries so I threw them in. It was the best!!!! That sounds great! I’ll have to try it next! Thanks for taking the time to comment and share your tips. I just made these tonight. I was pretty happy with the result. Thanks SO much for the recipe. I could not however get a nice homogeneous mix. The cream seemed to want to separate from the gelatin. Do I need to blend longer? I let the blender have at it for about 2 minutes on high. Hmm…..I don’t remember having that problem but I’ll try to make them again tonight and see if I can figure out your problem. I made them again and I didn’t have any problems. and the cream into the blend and mixed for about 20 seconds? It seemed to work for me. Here is a picture of them. Please let me know if you have any other questions about this recipe. Thank you Denise for such a quick reply and test on your recipe. I am going to make these again this weekend and I’ll let you know how things turn out. I’m not sure if it matters, but I used “Whipping Cream”….at least that’s what it said on the carton. Do you think there is a measurable difference between “Whipping Cream”, “Heavy Cream” and “Heavy Whipping Cream”? Silly question, I know….just curious what your thought s are. It doesn’t matter if you use heavy cream or whipping cream. As a matter of fact when I made them the other day I used heavy cream for 1 batch and half and half for another. The half and half had less carbs so I wanted to try it and I felt the taste was the same. So I think any kind of cream will work, just check out the carb content if you doing this for a low carb treat. Hope that helps! Did you ever experiment with pudding flavors? I was thinking the cheesecake pudding flavor would be awesome!?!? I have never tried the pudding flavors because they have quite a few carbs compared with the jello. However I agree the cheesecake would be fantastic. Please let me know if you try it! Yummy! 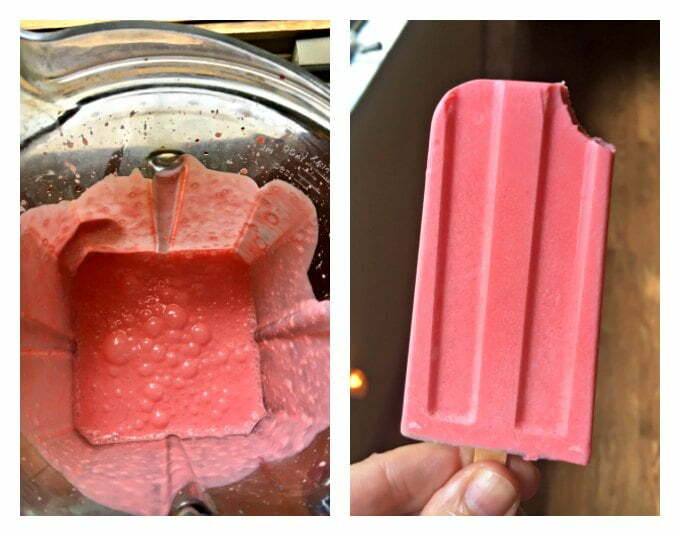 FYI… Ikea popsicle molds work great…got 2 for less than $5! Great to know! Thanks for stopping by and I’ll check those out the next time I’m there. I love Ikea! Do you have the nutritional facts for these? Also could you do cream cheese instead of heavy cream or might that add a lot more carbs? As for the cream cheese, it might add a few more carbs but it might taste like more cheesecake like. I’m not sure as I’ve never tried it. If you do let me know how it goes. I’m going to just guess on this one because I have never done it but I would say half of a block of cream cheese (4 oz). I was worried it wouldn’t mix then I remembered the hot water. Let me know how it goes! How dovyou store them in the freezer? Do you pop them out and then wrap in Foil or Saran? I use those cheap sandwich bags that don’t have a ziplock. Do you know the ones? They seem to work the best. We end up eating most of them in a few days so usually I just leave them in the mold. Hope that helps! I tried this tonight and they seemed to have a weird texture. I might try just koolaid pops or maybe I could do jello with less cream. Hi Em, the texture is probably from the gelatin. It didn’t bother me but I think that is what you might not like. I think your idea would work just blend it really well in the blender to get it creamy. You would have to use a sugar free koolaid and possibly sweetener to keep it low carb though. Please let me know how it comes out if you do. Thanks for stopping by! this recipe sounds awesome! which molds did you order on amazon? i want to make sure i get the correct ones so that each serving size is correct.. thanks! I used these http://amzn.to/2ru79vj however you can use any kind of mold as long as you make the same number of servings as I did. That way you would get the the correct nutritional information per pop. Hope that helps! I don’t have a blender so I attempted this with my mixer. It is super lumpy and not creamy at all. We’ll see what the end result looks like. Hi Laura, I think the blender adds air to the cream to make it more of a whipped cream. Maybe try to whip the cream first and then add the gelatin slowly? I have never tried it but I think that should work. I can only find sugar free jello gelatin in 0.3 oz size so does that mean I need to use 12 boxes? Hi Alexis. The 0.3oz size is correct. Thank you so much for bringing this to my attention. Please let me know if you have any other questions. Hello, so to clarify – I should use 1 box of .3 not 1.3? That is confusing….you want to use 1 of the small box (0.3 oz). So it’s is 0.3 oz. I have a question… did you use heavy whipping cream? I just want to make sure before I make this. Looks fantastic Denise, can’t wait to try this! Nice and cool and yummy in this hot weather we are experiencing. Thanks Maureen! I’m really happy with how they turned out!